Welcome to our Rings page. Our selection includes exquisite Native American rings to add to your jewelry collection, or to complement your favorite wardrobe items. 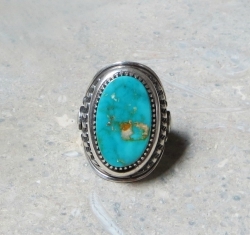 We select for only the finest sterling silver, turquoise, and other precious gemstones, and we work with our favorite award-winning Southwest and Native American artists from Arizona and New Mexico to bring you stunning silver ring designs and vibrant gemstone pieces. The Navajo and Zuni are widely renowned for their exceptional silversmithing techniques. In fact, the Zuni learned many of their techniques from the Navajo in the late 19th century. 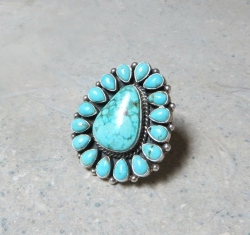 Turquoise stones are commonly set in the Native American rings, as well as other precious gemstones such as spiny oyster shell, black jet, lab opal, green gaspeite, purple sugilite, lapis lazuli, onyx and other gemstones. 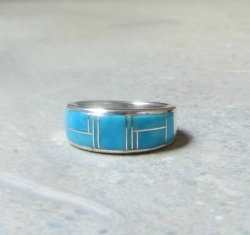 Navajo and Zuni artists often work with such designs as multi gemstone inlays, feather band rings, single gemstone rings, and other traditional and contemporary ring types. Turquoise has been a prized gemstone for thousands of years, and is considered one of the oldest gemstones known to man. 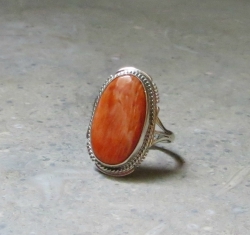 It is a beloved stone across many cultures and is highly prized for bringing life and fortune. 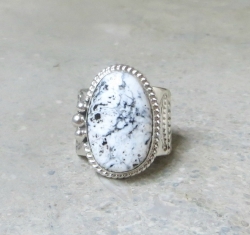 Black jet and spiny oyster shell are also common traditional gemstones used in Native American jewelry, and along with other gemstones, are used to add color, interest, and design variation to our Native American rings. 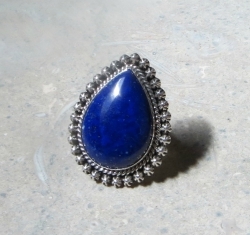 Our rings are perfect for men and women of varying tastes and dress styles, and we carry many different styles from renowned Southwest and Native American artists from Arizona and New Mexico. We carry sizes 5 to 12 (and above) for most of our rings, and for our inlay rings you can special order your own size, so you're sure to find what you need. Southwest Silver Gallery specializes in the finest Native American jewelry coming out of the Southwest. We select for rare, genuine, quality materials and we work with the top Native American artists from the Hopi, Navajo, Zuni, and Santo Domingo tribes to ensure pure and authentic jewelry pieces. Our passion is for stunning and genuine wearable works of art. You won't find any imitation imports coming from our gallery; we deal only in high-grade jewelry. 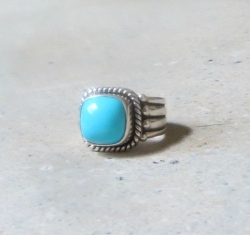 Take a look at our wide selection of Native American rings. 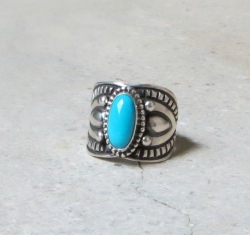 We organize our rings into sizes so you can find the pieces that are right for you, and our selection of styles offers you a stunning variety of Native American jewelry. Each of our pieces of jewelry comes with a certificate of authenticity, and we are so confident you will love wearing our jewelry, we offer a satisfaction guarantee. Have any questions about our selection? Please call 888-476-4367 and we'll help you find what you are looking for. Browse our gallery of rings today.